This YouTube no adult rating but my political YouTubes on mega corruption Bloomberg NYC Gov CityTime and 911 adult ratings. My 2 YouTubes on corruption Bloomberg, NYC Gov exposing more than the video above and I have an adult rating? http://youtu.be/Q9fIJQ5p3wQ I am wearing a shirt I wear out on the street. No big deal. What if I was flat chested? Sexual discrimination and political censorship. http://youtu.be/YTAkt98DbDc 911 Tech system corruption hospitals closed Hurricane Sandy adult rating but the Kim Kardashian video not adult rating. ANOTHER YOUTUBE WITH NO ADULT RATING BUT MINE HAS ONE AND I ACTUALLY HAVE AN IMPORTANT POLITICAL MESSAGE AND HISTORICAL IN TERMS OF NYC CORRUPTION AND THE 911 FAILING MEANS DEATHS. Mike Bloomberg Baby Putin and mini-me Quinn Employ NYPD to Monitor Activists? Most be Serious Over-Time! 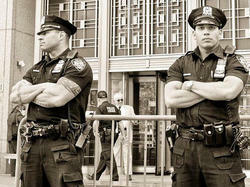 USE NYPD TO MONITOR ACTIVISTS ? NEW YORK – (MONDAY, 26 November 2012) – During the early morning hours of Saturday, 24 Nov 2012, an employee of the New York Police Department visited one of the blogs authored by Louis Flores. The blog post visited by NYPD states how Christine Quinn, the Speaker of the New York City Council, would continue the controversial NYPD practise of stop and frisk on minorities if she were to be elected mayor of New York City in 2013. Mr. Flores is at work on a book providing an overview of the political ethics of New York City Council SpeakerChristine Quinn. In the past, the NYPD have used physical force against Mr. Flores whilst he was trying to take a photograph of Speaker Quinn for his upcoming book under his Constitutionally-protected First Amendment right of freedom of the press. Mr. Flores issued a FOIL request to NYPD following the use of physical force, which the police department has denied. Mr. Flores filed a complaint with the Civilian Complaint Review Board (CCRB) over the use of physical force by the NYPD. Thus far, the CCRB has not yet responded to Mr. Flores’s complaint, but Mr. Flores was contacted by NYPD CaptainJack Jaskaran, who does not work for CCRB. NYPD have a history of violating the Handschu Agreement. And Mr. Flores has written on his blog questions about the role of Speaker Quinn in overseeing the NYPD. 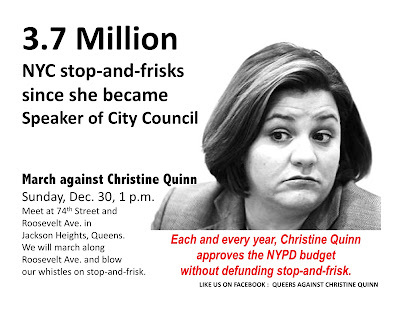 Because Speaker Quinn is one of only a few city politicians, who can give orders to NYPD, what kind of oversight, approval, or objections has she made about any illegal monitoring acts by the police department ? Mr. Flores is at work on finalizing the first installment of a book, tentatively titled, Roots of Betrayal : The Ethics of Christine Quinn. NYPD Intelligence Division on behalf of Mike Bloomberg and Christine Quinn violating NYPD protocol except for Lt. O'Sullivan super-hottie who just violates my civil rights but to his credit he is very polite. This YouTube series has several activists footage including mine. Tonight be there -- if you can't restrain yourself boo Mike Bloomberg and Amanda The People's Burden -- the worse most evil city planner commissioner in NYC's history. Where ever you live in NYC she has aided and abetted her greedy pals in busting through zoning to destroy our community so you can see her -- a mega-millionaire socialite looking ghoulish from too much plastic surgery and injections in her face making her look like a Coney Island Freak except she has no soul. This is a film about fighting for the SOUL of NYC and how the Bloomberg administration talks out one side of their mouth but their actions are evil. Watch this film about a historic amusement ride "Zipper" - you will be laugh and love the People of Coney Island -- laugh with them and cry too but you will never be board and yawn like one of the NYC gov representatives as a Coney Island Native fights for the heart and soul of the community. Amy Nicholson captures the texture and beauty of the People their soul as Bloomberg's battalion of zombies with their black berries are interviewed and lie in your face lie they get in bed with Thor and you learn what a creep "Joey Coney Island" is what he calls himself but a sign posted where an amusement rides is tells him to drop dead or something like that. This movie will be a cult classic with great music and film montage cross cuts showing the two sides dark and evil -- so mid night showing dress up like a Coney Island Freak and scream at the evil characters boo your heart out at Mike Bloomberg, Christine Quinn who looks EXTRA HIDEOUS -- really frightening but truly Amanda the People's Burden looks like she is like a soulless living dead zombie and she delights in bringing a Duane Reade to Coney Island! She has a 40 million dollar trust for her kids. Reminder Coney Island was RAVAGED by Hurricane Sandy and so was Coney Island's Hospital but greed and stupidity rule. What is Joey of Thor going to do if there is a Tsunami besides Bloomberg's corrupt Tsunami of Community Crushing development on old NY"s infrastructure. No St. Ann's Church 120 W E 12 We asked for protective zoning but as usual Bloomberg and The People' s Burden with NYU pushed through an illegal air sale by the corrupt mega-billion dollar loser The USPS to NYU and St. Ann's from 1847 destroyed. Visit the location see the facade there like an Albatross around the NYU's mega dorm -- NYU mega dormed the East Village to death along with The New School, Cooper Union, NY Law, SVA. See this excellent film because if you live in NYC these people -- the soulless army of Bloomberg's administration destroyed your community and the soul -- see this smart soulful entertaining film that will make you laugh and cry. ps Here I am with Coney Island Jane Jacobs yelling down Christine Quinn at Jane Jacobs Street naming and Jane is turning over in her grave. At Crain's breakfast they even called deputy Goldsmith Jane Jacobs. NYC gov so phony and delusional as they destroy our great city. No one has asked mayor Bloomberg, Christine Quinn (and this is her district), Bill Rudin and The Rudin Family, Scott Stringer, Amanda The People's Burden, the commissioner of Dept of Health and Howard Rubenstein where is the hospital? Forget about his clinics give us our hospital back! This is a subdiffuse to avoid asking about the fact that we have no hospital and NYU and Bellevue are under water while 11 Street and 7th Ave is bone dry! AND AS DOUGHERTY POINTED OUT ST. VINCENT'S HOSPITAL GENERATOR WORKED DURING HURRICANE SANDY!!!! Pinch me! Wake-up I must be dreaming!!!!!!! 4:30 am not sleeping --- amazing - I set a world's record on CityTime and ECTP 911 blog posts and YouTubes and finally we see the first editoral exposing 911 corruption -- 911 is a bigger city crime than CityTime!!!! 911 will be proven to be the largest in NYC gov history with CityTime coming in 2nd but 911 also cost lives. http://youtu.be/cQbPpkjhwcI YouTube response to Josh's article praising Josh Margolin. If he keeps this up he will win another Pulitzer. This is bigger than CityTIme and there is citytime news that will break I hope soon re: shareholders holding top SAIC officials acccountable something we have yet to do. A comment on a CityTime YouTube states Denault never signed NYC gov contracts. SAIC shareholders took my blog and put it in their law suit minus typos and do go back in time to Valcich letter which I read in part on YouTube and point out the corruption clearly went back before Denault is hired and clearly based on the letter before 2003. The first deaths 911 I remember reported in the press and I am not privacy to stats outside of the press --- was in the Bronx City Island. Next reported was Bloomberg's Blizzard -- stay tuned. Liu called for a criminal investigation after a 20 page audit and we never got it. Aug 20 I called the FBI for help asking they assist -- the woman agent did not know Liu was comptroller. Than I stumbled on Bloomberg at a press conference and yelled him down about CityTime and ECTP 911 Tech System....I yelled 2 billion 14 million dollars and it does not work properly. Than the NYPD NYC Gov tried to remove that YouTube and the other one I posted where Mike's private NYPD intelligence divi security det does not obey NYPD protocol. Google YouTube sided with me. Despite the NY post editors and a certain reporter being beyond awful I give whom ever wrote this highest praise and would hug you for this article. This link will bring you to the video of me yelling down Bloomberg. He than told reporters they could ask him about what I yelled after and NONE DID! This editorial speaks to my yell down but I called Bloomberg the most corrupt mayor ever. CityTime, ECTP 911 is 3 billion in tax payer abuse for very flawed tech were there was I believe mega stealing and abuse going on and than remember Josh's piece on NYCAPS? Than read NY Post article with Linda Gibbs quote on Seedco. Linda Gibb was Joel Bondy and Mark the Momzer Mazer's boss Children services and look at her quote on seedco! She should be fired in my opinion as well as others who should be forced to resign. I want Bloomberg and Mark Page, Patti Harris to resign. Good to see her son got a soft landing from his NYC gov IT job where he ruled as king and will Bloomberg's sister's best friend get a soft landing and be leaving naytime soon? The NY Post editors and I do not agree on Bloomberg resigning. City Council is as guilty not starting with Christine Quinn who brushed aside 2 investigations in to CityTIme and note Joel Bondy testified under oath. He got a soft landing. No arrests of NYC Gov officials. Not one! When will have the criminal trial of ECTP the 911 Tech system. I know the NY Post editors hate John Liu but good job John Liu calling for a criminal investigation after your 20 page audit and thanks to Bloomberg and Cy Vance we have none! Looks like we will now. CityTime criminal trial does not begin until Sept. 2013 lucky for Mike and the 911 trial will start when? After Bloomberg is out of office? Law suits for CityTime OJ Trial in reverse. 911 CityTime 2.